Love mixing pinks and greens. Pixie Baby in Pink is the perfect little girls bedding for you. 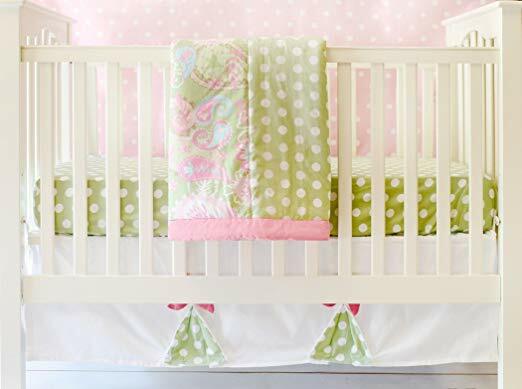 This baby bedding mixes playful patterns with pinks and greens, it is sure to be the focal point of any little girl's nursery. The matching sheet uses the green polka dot. The 14 in. skirt is white with two green polka dot pleats tied with pretty pink. The matching blanket is made from pink and green paisley and green polka dot.